City Art will be open for all to shop! The art supply store will be open with all sorts of art supplies on sale. Artwork featuring Sergio Maciel’s MFA Exhibition in the main gallery hall. Artist available to talk with patrons. Featuring paintings by Melissa Payne Baker as well. Plus there are dozens of artists represented in all three City Art galleries from jewelry, original photography, paintings, and much more. Get involved in the City Art experience. It is like no other. Ellen Taylor Interiors + Design featuring works by Jim Victor. 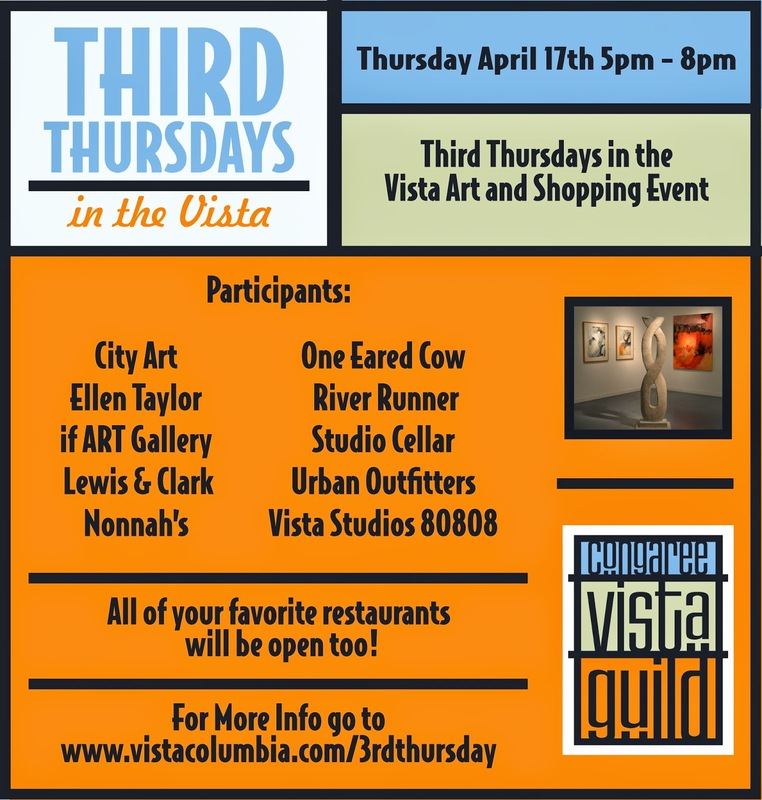 If ART Gallery: Columbia native and poet Quitman Marshall will present a poetry reading and book signing at if ART Gallery during the downtown Vista district’s second Third Thursday, April 17, at 7:30 p.m. Marshall will read from his new collections of poems, You Were Born One Time, published this year by Ninety-Six Press at Furman University in Greenville, S.C. The collection won the South Carolina Poetry Archives Book Prize 2013. Urban Outfitters: Participate in a Tie-Dye Workshop, 6-9pm! Just bring in items to tie-dye or dye any item that they purchase that night for FREE. Kona ice truck will be here and the first 100 guests will receive FREE snow cones. 10% off full-price and 30% off sale merchandise that night!